Over the past three decades, obesity rates in the U.S. have more than doubled for children and tripled for adolescents -- and a startling 70% of adults are now obese or overweight. The result has been a widening epidemic of obesity-related health problems, including coronary heart disease, high blood pressure, stroke, and Type 2 diabetes. While discussions about this spiraling health crisis have tended to focus on the need for more exercise and individual responsibility, Feeding Frenzy trains its focus squarely on the responsibility of the processed food industry and the outmoded government policies it benefits from. It lays bare how taxpayer subsidies designed to feed hungry Americans during the Great Depression have enabled the food industry to flood the market with a rising tide of cheap, addictive, high calorie food products, and offers an engrossing look at the tactics of the multibillion-dollar marketing machine charged with making sure that every one of those surplus calories is consumed. "Given the sheer power of today's consolidated food industry as a marketing behemoth, it's a relief to have the critical eye of Media Education Foundation dissect what's being sold to consumers as a healthy food system. In their new documentary Feeding Frenzy, Sut Jhally and a savvy set of experts and practitioners unpack the contradictory, confusing, ubiquitous, and deeply problematic discourses of agriculture, food, and health, raising critical questions about responsibility, choice, and power without succumbing to the moral panic of many other films. This will be a powerful tool for the public, the classroom, and political discourse." "An excellent expose: of the real problems underlying America's toxic food environment. Unlike other films, Feeding Frenzy provides pivotal insights into the marketing industry and their strategies targeting children. This highly accessible and entertaining documentary is an invaluable tool for parents, teachers, and advocates." "A smart and comprehensive investigation of how broader structural factors shape food consumption, Feeding Frenzy examines the power of food marketing to manipulate our emotions and to create an illusion of health in its products. It offers a compelling and critical look at the food marketing strategies that ultimately impact our health, addressing questions like: How does the food industry create new norms that encourage us to eat more than we need? How do they make foods lacking in nutrients palatable? This film is not only beneficial to nutritionists and sociologists alike, but anyone who picks up a fork." "Feeding Frenzy's mix of mouth-watering food commercials and sobering expert interviews will open your eyes about mindless eating, how little we control it, and how much food marketers are doing to make us eat more. A must watch for all, in or outside North America." "Another fascinating food documentary on the corporate agenda of the agriculture and food industry. If you had any question that farm and food policy drives public (ill) health, this film will make you a believer." "So many videos on food focus on production, but not as much on the market and consumption side. Feeding Frenzy does a fine job of explaining how our food environment is manipulated to get us to buy and eat more than is good for us." 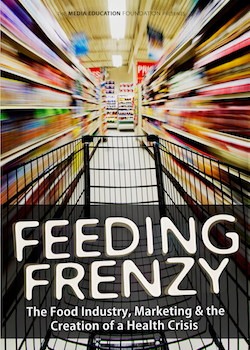 "Feeding Frenzy takes us through the dark side of the food industry and its marketing arm. It shows us how the efforts to manipulate what and how much we eat reveals the same kind of game plan that the cigarette corporations used to hook people that led to their health crisis. With the wit, clarity, and compelling visuals and analysis that the film provides, Feeding Frenzy helps us understand that we need to challenge the food industry the way the cigarette industry was challenged and the marketing was contained and overcome." "Food companies succeed when we buy more of their products -- it's that simple. So we are not people to them. We are buyers, and this film demonstrates that they will go to any lengths to convince us to buy. Feeding Frenzy persuasively argues that if we want healthy communities, we cannot simply focus on the choices individuals make. Rather, we must fight all the choices companies have made by constructing a policy environment that curbs their power to deceive us and pollute our bodies. A powerful film." "The eye-opening film Feeding Frenzy makes clear that while personal choice plays a role in food decisions, there's so much more at play. Companies work hard to bypass rational choice through big portions, selling food everywhere, packaging, products scientifically formulated to stimulate overeating, toys, games, apps, making it acceptable to eat everywhere and anytime, and other buy-more techniques. It's no wonder obesity rates are sky-high!" "A compelling call to fend off the onslaughts of highly processed foods and run to embrace foods identifiable as coming from the Earth, not the Chem Lab."